Steve used to have to leave an hour earlier for church the year that he worked as a youth intern. 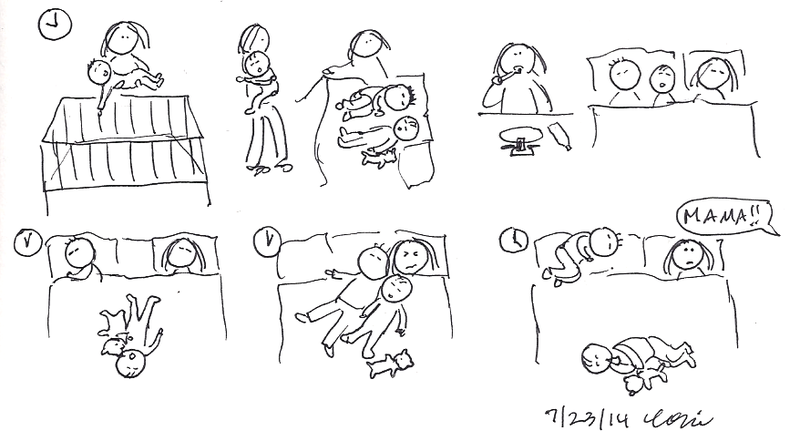 Sometimes he would graciously let me sleep in (I was still nursing Benjamin at night) while he helped get the older two boys ready. Benjamin was a pretty laid-back baby. Our church has a parent-paging system connected to the nursery and the main sanctuary. Babies are assigned a number, and if the baby can’t be soothed, the parent is paged with a light-up red number sign in the front corner of the sanctuary. I always felt slightly embarrassed when our number lit up, showing the entire congregation that we our baby was The Crier. 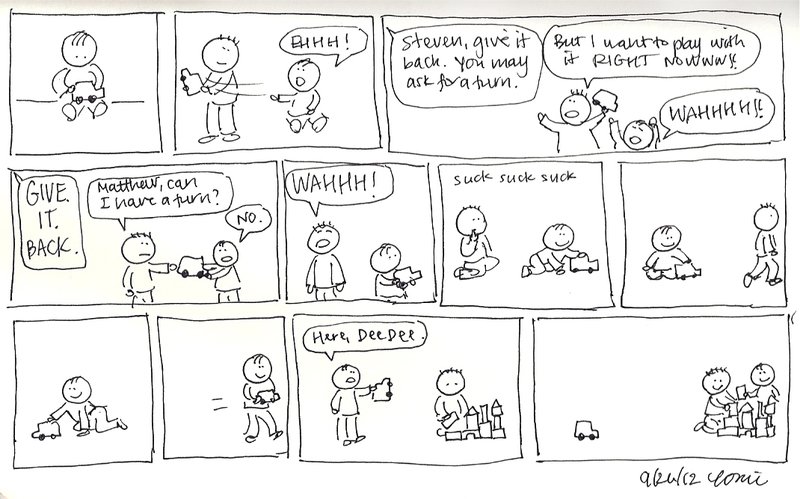 We had the “grabbing toys away from the younger brother” problem with Steven and Matthew, too. 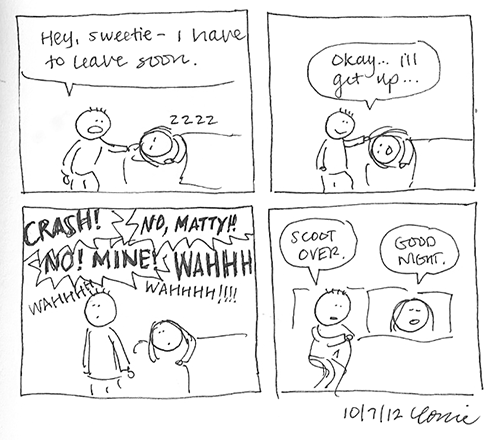 This week will be a five-part series of comics detailing “Why I was tired” last Wednesday. 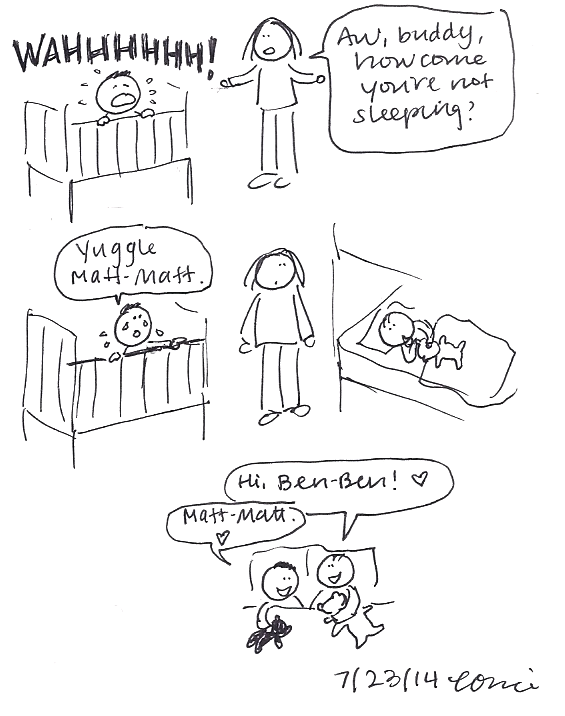 Usually Benjamin is an easy kid to put down (if sometimes high-maintenance) – once he has his bear, blanket, pillow, etc., he joyfully cries “nigh’ nigh’! Wuh yuh! Muh-nee!” and there’s not another peep. 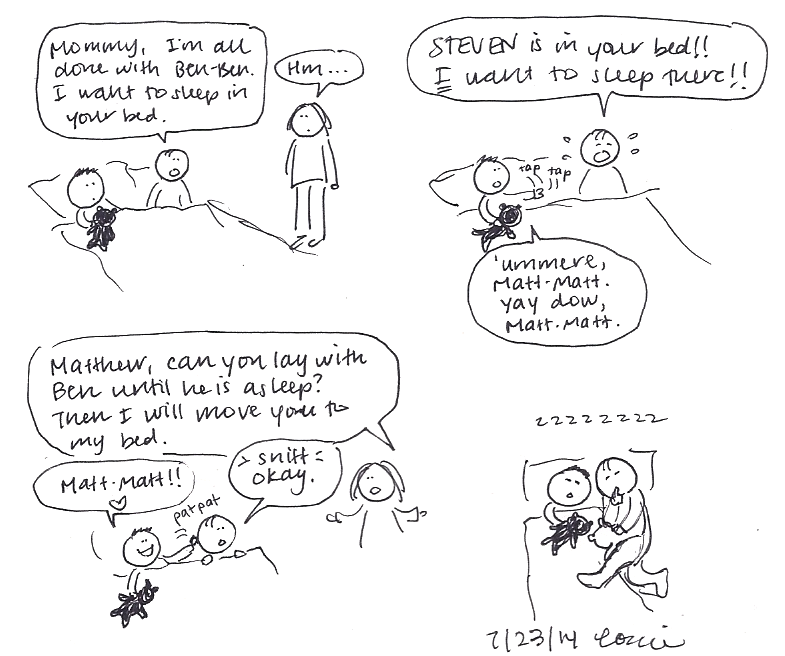 But last week, perhaps because Benjamin missed Steve as his primary caretaker, he was especially clingy when it came to bedtime. And by clingy, I mean literally clingy. One of my favorite comics, generated from 2011’s NaNoDrawMo. The toddlers pictured above are Matthew and Steven. Why is the house cleaner when Steve is gone? Steve has been gone since Monday, and the living room, entryway, kitchen, and bedroom have been unusually clean. 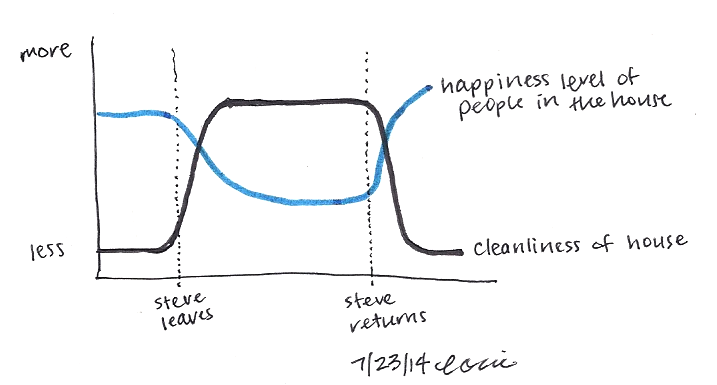 With Steve gone, however, the kid (encouragers of entropy) – to – adult (opposers of entropy) ratio is greater. 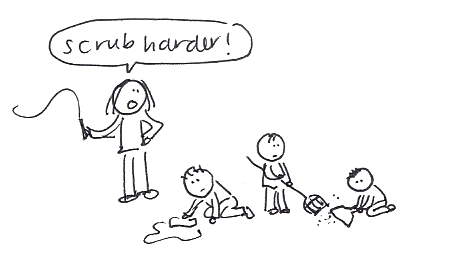 A. Corrie forces the kids to clean up when Steve isn’t around to report her to CPS. B. Corrie doesn’t have to pick up after Steve, just after the boys. C. Corrie is lonely and ends up cleaning since she can’t hang out with her best friend. Steve is coming home tomorrow afternoon. I predict that our house will become messier, but that our overall happiness level will be greater.